PARK CITY, Utah – Every film festival produces at least one film (hopefully more) that just blows audiences away, shattering expectations and leaving them breathless. The future Oscar nominee from Sundance Film Festival 2013 is Richard Linklater’s “Before Midnight,” a film that is quite simply perfect. Now is the time in a feature when I would generally try to wrap up everything I’ve seen into one thematical bow for this particular piece. Screw that. I need to talk about my favorite movie in quite some time first. We’ll get to the others (and, to be fair, a few of the others are quite good.) I need to talk about Jesse & Celine. It’s been nine years since Richard Linklater, Ethan Hawke, and Julie Delpy made the brilliant “Before Sunset,” a beautiful sequel to their charming “Before Sunrise.” Nine years later and the lovers from Linklater’s first two films have become a much-more-typical married couple. The film opens with Jesse (Hawke) saying goodbye to his son Hank at a Greek airport. The boy has spent the Summer with his dad and is going back to Chicago to be with Jesse’s ex-wife. It clearly hurts Jesse to say goodbye. A suggestion in the car that maybe they could do something about being with Hank to his wife Celine (Delpy) starts something rolling. It’s not your typical movie argument but “Before Midnight” is not your typical movie. As in real life, when we are hurt (as Jesse is) or feel blamed or looking at a potential life shift (as Celine does), things rise to the surface — gender roles, past hurts, and questions about what the next decision brings. As Jesse and Celine have what is, essentially, like the first two films, a movie-long conversation, they paint a portrait of everything that comes with nine years of a relationship — love, pain, hate, happiness, and questions about the past and the future. “Before Midnight” left me nearly breathless. The script (credited to Linklater, Delpy, & Hawke) perfectly captures the complexity of marriage in ways that have rarely been portrayed on film. I won’t spoil where “Midnight” goes but people who have been married long enough will undoubtedly see part of their relationship in this one. And yet Jesse & Celine are completely realized, three-dimensional characters in every way. They are not cliches and yet they feel like truth. They feel like people we know. Julie Delpy does the best work of her career (she’s nomination worthy) and Linklater shows even more brilliant restraint than in the past, often just shooting unbroken as the two walk the streets of a small Greek coastal town. I will write a lot about “Before Midnight” as time goes by and have tried to limit myself to two paragraphs at most during these Diary pieces and so I need to move on but there’s so much to digest, cherish, and adore here. It’s the best film to play in Park City this year and will be one of the best of 2013 whenever it plays in your town as well. Let’s stay on the positive tip with a completely different film experience — Jason DaSilva’s powerful, inspirational “When I Walk,” the best doc that I’ve seen at Sundance this year. When he was 25, DaSilva was on vacation with his family in the Carribbean when he fell on the beach and had notable difficulty getting up. The documentarian was diagnosed with Primary Progressive Multiple Sclerosis, a rapidly-moving disease that ate away at his nerves, making it more difficult to walk and even see as time went on. Instead of retreating, DaSilva made his heartwrenching journey into a film. And it’s nowhere the painful dirge that it could have been with a lesser filmmaker or less optimistic subject. DaSilva’s film proves that there can be beauty in pain and that we should never give up working to relate to others, find our strength, and have complete perspective. As Jason was so encouraged to think by his scene-stealing mother, your life could be bad but someone else’s is worse. I really hope someone picks up “When I Walk” and gets it to a larger audience. It’s a great film. Speaking of great films, you may remember Sebastian Junger & Tim Hetherington’s “Restrepo,” an Oscar nominee for Best Documentary in 2011. Hetherington, a brilliant wartime photographer, passed away just a few months after the Academy Awards, killed in mortar fire in Libya, and his work is chronicled in the powerful “Which Way is the Frontline From Here? The Life and Time of Tim Hetherington” from former collaborator Junger and playing eventually on HBO. The most breathtaking element of “Frontline” is the extensive use of Hetherington’s photography. The man wasn’t just fearless in his approach to photojournalism, he was an AMAZING talent. The work he did in Liberia is absolutely stunning. I almost wish more of the film consisted of just Hetherington’s work although interviews with friends, colleagues, family, and his girlfriend work together to form an impressive eulogy. The final doc in today’s diary is Andy Heathcote’s “The Moo Man,” a gentle piece about Stephen Hook, an expert farmer and milk producer whose kind approach to cows have mad him something of a “Whisperer.” Not only is his milk loved above others but his cows live much longer than the average bovine. Hook seems like a wonderfully affable man and I’m sure it would be fun to spend a day with him on his actual farm but Heathcote’s film is too languid, taking 20 minutes longer than it should to wrap up. There’s almost nothing to “The Moo Man” as life on a farm is, understandably, slow. This might have made a great TV special but falls as an overlong film. Finally, we get to two of the wackiest films at Sundance 2013 and they come from wildly different ends of the filmmaking system’s scale. 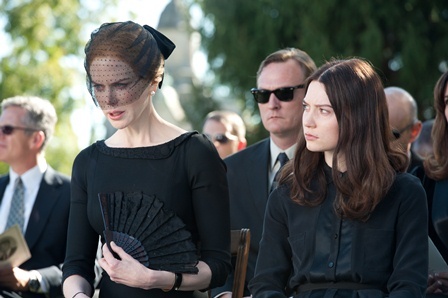 On one hand, you have Park Chan-wook’s “Stoker,” a big-budget affair opening in March and dividing audiences in Park City. Some admired Park’s approach to what is essentially a Hammer film (with heavy homage to Alfred Hitchcock’s “Shadow of a Doubt”) while others found its weird style disguised a lack of substance. I’m more in the latter camp, thinking that Park and his game cast (including Mia Wasikowska, Nicole Kidman, and Matthew Goode) do a lot of heavy lifting for a script that’s really quite awful. There are some striking visuals here and Park’s incredible skill (along with a great score by Clint Mansell) make it enough of a sensory experience for me to recommended but I’d be lying if I said I gave a damn about anything that happened in the actual story. I feel similarly about Randy Moore’s highly-buzzed “Escape From Tomorrow,” a film getting all kinds of attention as the “Sundance movie you’ll probably never see.” Why not? Most of it was shot at Disney World. Moore and his crew used small cameras and shot around the Magic Kingdom and Epcot Center, making a surreal, guerilla-type fantasy that I’m sure the Mouse House lawyers are already trying to bury in a shallow grave. Not only did they not get permission, they use the Disney iconography in disturbing ways. The story is that of a family man gone off the deep end on his last day of a vacation in Orlando. DEEP end. He starts to see demon faces in Disney rides, becomes obsessed with two underage French girls who he follows around the park, and eventually gets deep into the dark underbelly of the Magic Kingdom. Too much of “Escape” is clearly first-take material and it feels like the filmmakers included every second of film they shot. This is the kind of work that kills at 20 minutes, might work at 75 or 80, but feels repetitive at 100. I get why people here in Park City are going gaga over it. It’s new and gets major points for originality. Although not as many points from me as I hoped it would. Back tomorrow with six more movies (at least). Stay tuned. Read all of Brian Tallerico’s coverage from Sundance 2013!